This began, as with many of my pieces, with a paste-up of cut-outs from magazines - weekend supplements, women's magazines [ I get them cheap in Milton Keynes market], and the Avon catalogue which comes through my letterbox. 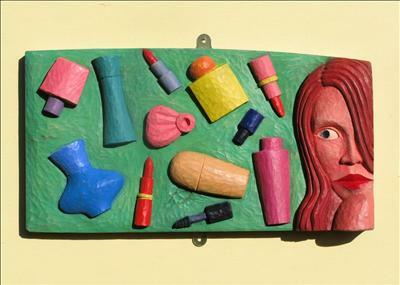 It continues my focus on various shapes of cosmetics and perfume bottles and how a relief carving of them transforms them and sets up resonances and allusions on various levels. The title tells the story.